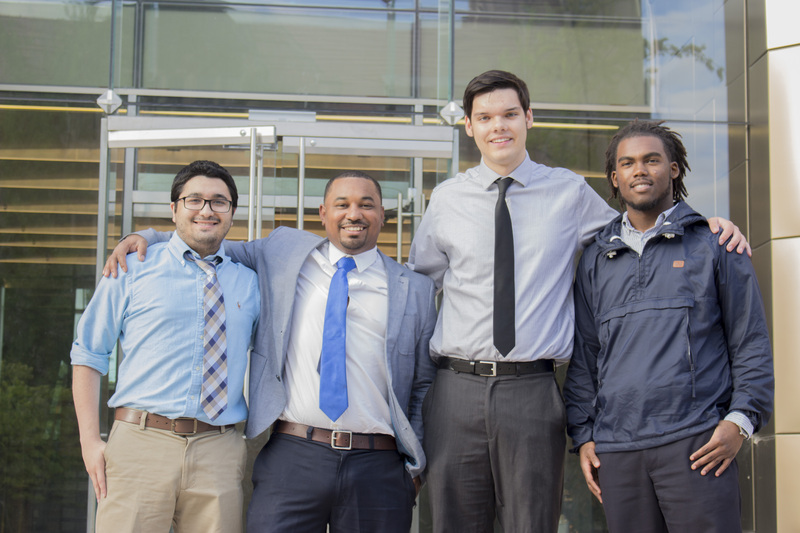 Photo Caption: (From left to right) Daniel Mula, Willie Preston, Adam Gurther and Ramone G. Kittrell are optimistic about their first debate. As the semester moves forward, a new organization hopes to spark deliberation amongst the Roosevelt community. The Rooseveltian Debate Society, or RDS for short, seeks to help spread the social justice mission of the university. The organization was first conceptualized in the 2014 spring semester when Willie Preston transferred into the university. Preston, a junior political science and economics, was immediately attracted to the social justice mission of the university. He was eager to follow his passion of speaking on these issues. Unfortunately, there was no organization that existed, but determined, Preston took the steps to create RDS. After gathering a team of dedicated students, around 10, and practicing for weeks, there has been progress. The Rooseveltian Debate Society is associated with the American Parliamentary Debate Association, also known as the APDA, one of the oldest and largest debate circuits in the country. The organization was started at Oxford University. As written in the American College Debate Association Guide, the style of debate used by the association puts two, two-person teams against each other in a competition of argument. The topics vary, ranging from political to humorous topics, all which are never repeated amongst competitors. The topics are given 15 minutes before the debate, which forces the individual to think quickly on their feet and make substantive arguments, one step at a time. Each round is separated into six parts. Each debate is held in separate rooms, with a qualified judge who scores each round. Instead of focusing on preparation and background research, having a general knowledge of topics and the ability to think quickly is rewarded. Two-day annual Novice Tournaments are hosted each year to introduce new participants to debate and to intensely train them through practice and seminar. From there, competitors have the opportunity to go to a North American Debate Championship, a National Debate Championship, and finally, the World Debating Championship. Most chapters of APDA are on the east coast, but universities such as DePaul and the University of Chicago have local affiliates. Earlier in October, the team had its first competitive debate at the University of Chicago. The team defeated University of Chicago and DePaul in the tournament, now cementing their starting record, 2-3.